AMT Boss Nova Wagon (Kit # T308). AMT'63 Nova Wagon funny car kit. Original AMT issue of the Nova Wagon funnycar, circa 1971. White plastic parts bag is factory sealed. Glass is nice and scratch-free. Box is in nice condition with some general shelfwear and no rips/tears/stains/writing. A solid 7.5 out of 10. See my other auctions for more scarce MPC (and other) original kits. 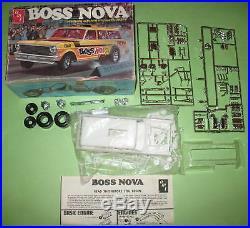 The item "AMT T308 Boss Nova Wagon Hemi Drag Car Original Iss MIB" is in sale since Saturday, June 5, 2010. This item is in the category "Toys & Hobbies\Models & Kits\Automotive\Vintage". The seller is "tiga78" and is located in Winnipeg, Manitoba. This item can be shipped worldwide.